To find out more about a Harrisburg Chamber of Commerce membership for reduced advertising rates, please see their Facebook page. Advertising in the Tiger Times is a good business decision! Your ad will reach over 3,000 households and businesses – everyone in the 57032 zip code (that’s over 5,000 people!). Our publication is also posted online and shared on multiple Facebook pages as well. When multiple issue ads are purchased, minimal changes to ads can be changed as needed for no additional charge. The pricing structure has changed as of January 2018. Ads are now measured in column width (this helps articles, pictures and ads “fit” together better, like pieces of a puzzle). Each page in the newspaper is 5 Columns wide. Ad widths are based on this notion. Heights can vary. 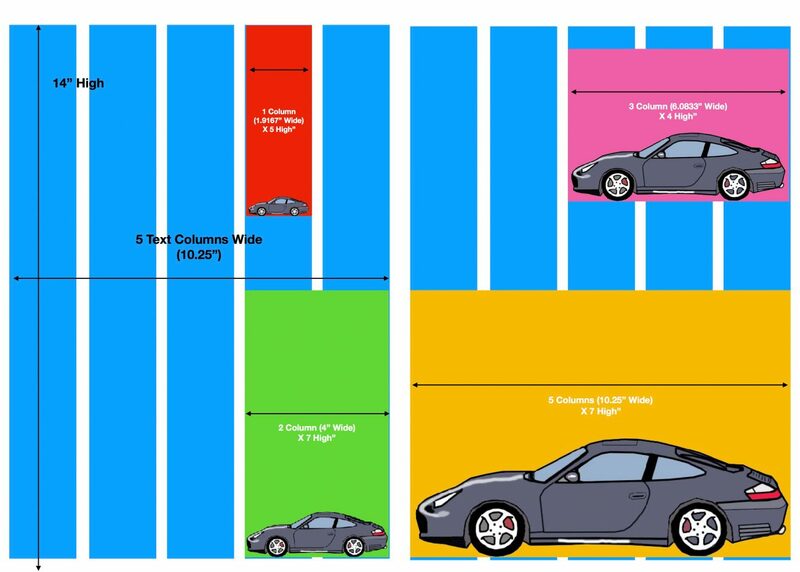 You will choose how may columns wide you want your ad to be and then how tall. You can choose any size combinations listed to customize your ad even more. Harrisburg Chamber members receive a significant discount in pricing. To become a chamber member, click here. A 10% discount is applied for any quantity purchased greater or equal to 3 of the same-sized ad for both Regular and Chamber Pricing.